February | 2015 | cut it out, stitch it up! When it comes to dresses I normally go for waisted styles buy I had seen a really great denim shift dress which was quite boxy that I wanted to try. I had been inspired by the Camber dress made by Laura at ‘behind the hedgerow’. Laura had taken this pattern and added a horizontal seam to include the front pockets and I really liked the use of the Liberty print facings and pocket bags. The Merchant & Mills Camber dress pattern does have some waist shaping but it’s still a dress you can pull on without any fastening. I drafted my own pattern and made up a basic toile with the intention of adding style lines once I was happy with the fit. But this is where I stopped. I wasn’t quite sure how I felt about it and I found myself thinking – need to make it slimmer here and add shaping here – which would have necessitated fastenings to get into, so it was taking me away from the original plan. So I put it to one side for a few days which has now turned into the rest of February and distracted myself by casting on for a pair of socks and making a Renfrew top. I don’t feel I’ve been very successful with this challenge but it did get me thinking and trying out a new shape for myself. I can picture the dress I want to make quite clearly so hopefully I’ll get the urge to pick it up again. I’ve been thinking about sewing my own knickers for a while as I had plenty of big enough cotton single jersey left overs. I just needed some stretch lace for trimming and knicker elastic. I finally got around to ordering these items from e-Bay. I don’t usually buy anything fancy, it’s normally the 3 pairs for £10 from M&S. But just as with their socks I was disappointed in the quality of some of the pairs. 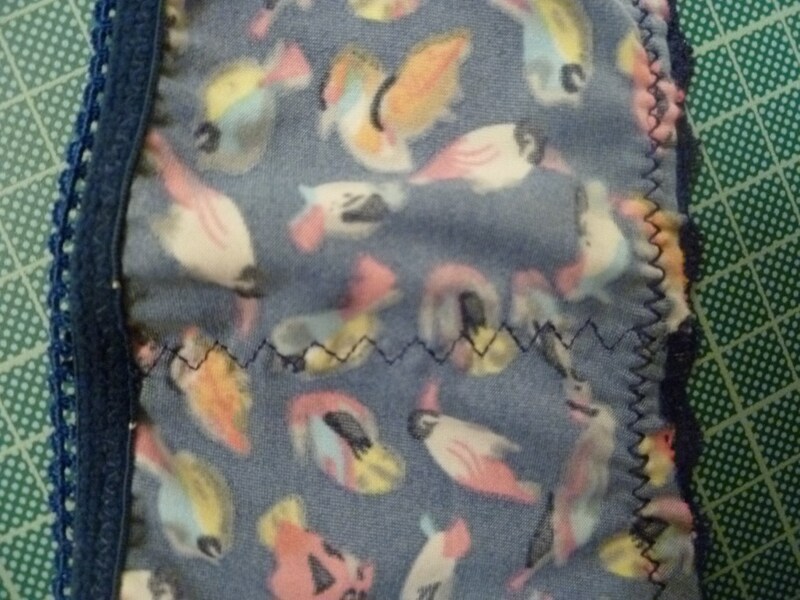 The next batch I bought were from Sainsbury’s, 3 pairs for £8 and the quality was much better and I noticed that all the sewing, except for the side seams which were overlocked, could be done on a domestic machine as it was just a zig-zag stitch. This got me thinking…. I could easily make these myself. 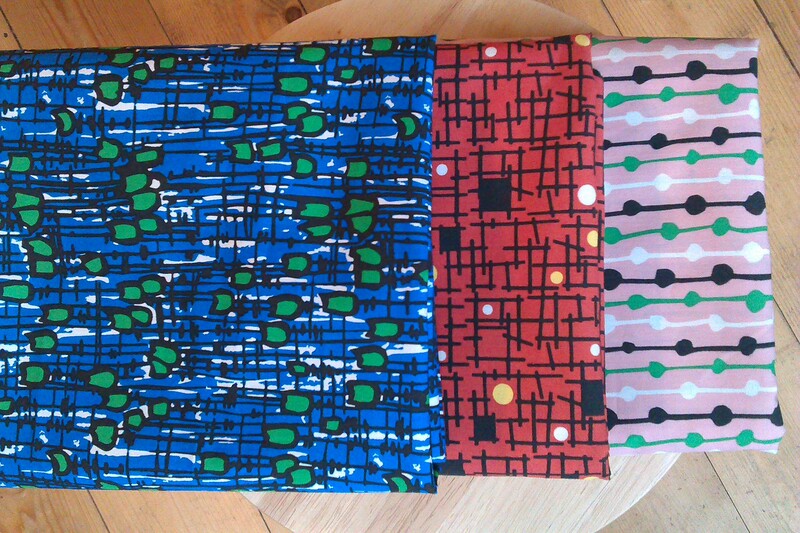 I copied the pattern, front, back and gusset. I had to do this twice as the first pair, which have turned into a wearable toile weren’t perfect. I needed to add some extra depth to the back and my first pattern had straight side seams and a straight top edge. On closer looking at the original pair the centre front and back were slightly lower than the sides and the side seams flared out very slightly. 2nd version of the pattern which were a much better fit. 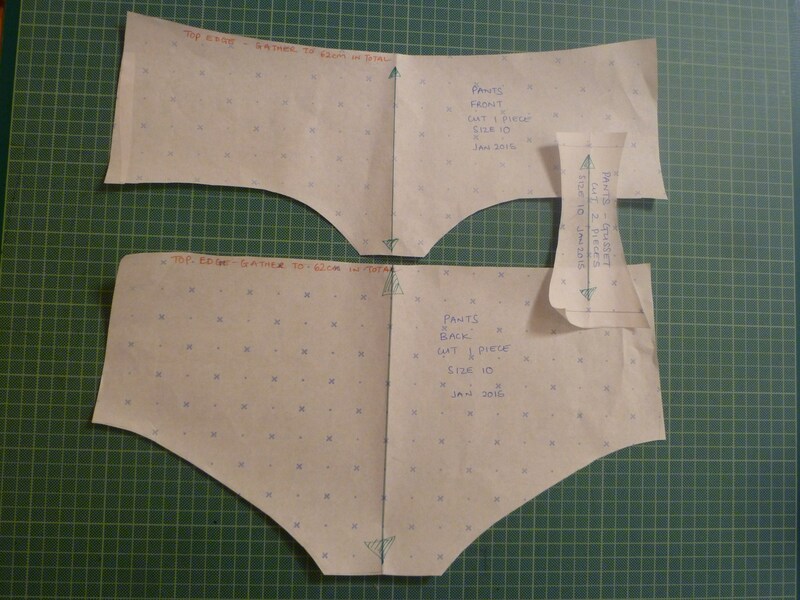 I also made a note on the pattern for the length of the waist elastic. I stitched them up in the following order…. 1. Stitched the lace embellishment to the front piece. 2. Stitched the two gusset pieces to the front , the front panel is sandwiched between the two gusset pieces so when it is completed the raw edges are enclosed. 3. Stitched the gusset pieces to the back. I did this one at a time so as not to get twisted and pinned the second piece and stitched on top of the first line of stitching. I used the triple stretch stitch for the gusset stitching. 4. 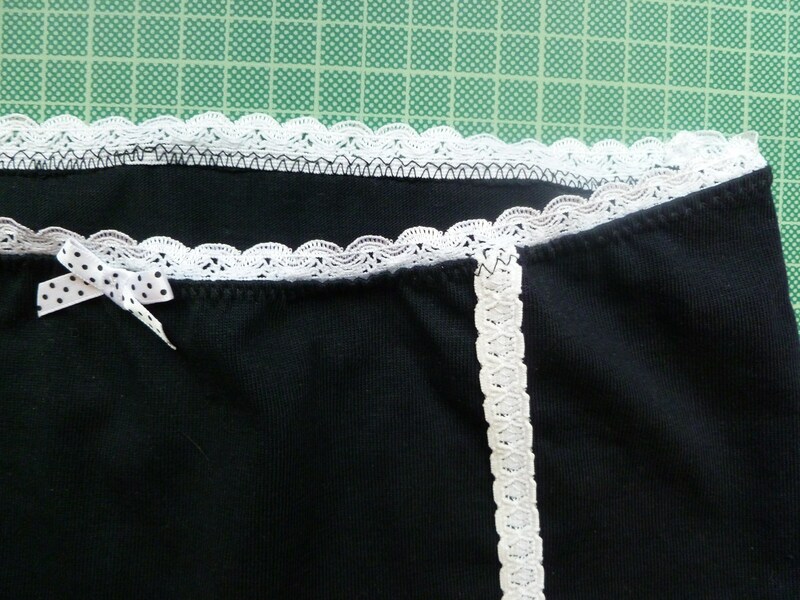 Stitched the stretch lace to the leg openings using a small zig-zag stitch. Before I started I trimmed the fabric at the gusset seams to make a nice curve. 5. 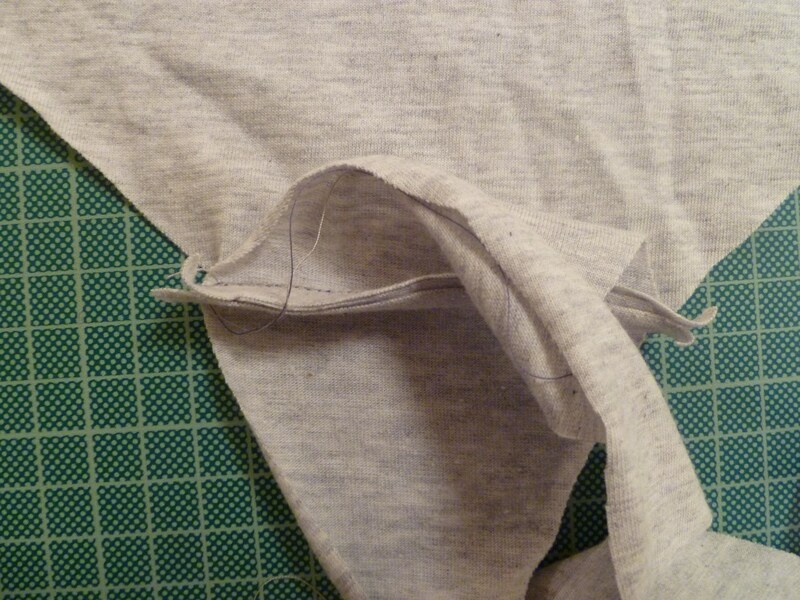 Stitched up the side seams using a the triple stretch stitch. 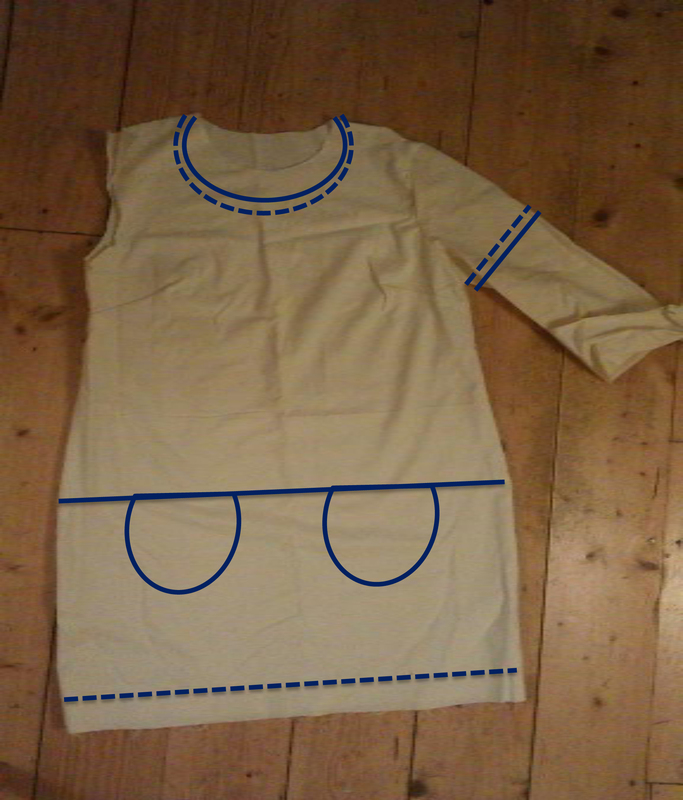 I couldn’t be bothered to set up the overlocker for this and then I finished the seams with a zig-zag. 6. Stitched the elastic around the waist. I pinned the elastic at the side seams and at the centre front and back to get the gathering even. I stitched it to the right side first using a small zig-zag then folded it back on itself and top stitched the seam allowance with another small zig-zag. 7. Finally add any decoration to the centre front. I made these a few weeks back and so far so good with standing up to washing and wearing. I made two black pairs and one white pair plus the grey marle wearable toile. The only problem with ordering the trims from e-Bay is that what a seller calls ‘white’ is ‘off-white’ to me. So the white pair don’t look that great. I found the quality of the elastic not as good as on the RWT pair, it’s ok but slightly thinner. But I did like these bows that I also found on e-Bay. I quite enjoyed my first steps into underwear and I can see me making more in the future but I don’t think I’ll only be wearing homemade knickers from now on.